Marc has been tapped to play “Mr. 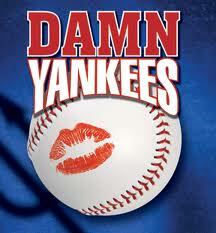 Applegate” in the July, 2014 Little Radicals Theatrics production of Damn Yankees. One of the lead characters in this classical musical, Applegate is the Devil, posing as a slick salesman who offers Middle-aged real estate agent Joe Boyd—a long-suffering fan of the pathetic Washington Senators baseball team— a deal: if he gives up his soul, Joe will become “Joe Hardy,” the young slugger the Senators need.